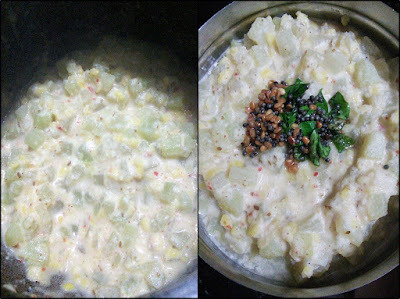 (Chayote with moong dal and coconut paste) - This is my mother's recipe. She always cooks the vegetables either by steaming the vegetables or by boiling them in a separate deep vessel with less water. She doesn't like the pressure cooking the vegetables as they lose its colour and the texture. Now I'm also following her way of cooking the vegetables. In this kootu the chow chows retain its texture and the colour. This kootu is a perfect side dish for rasam, pulikuzhambu and also for rotis. 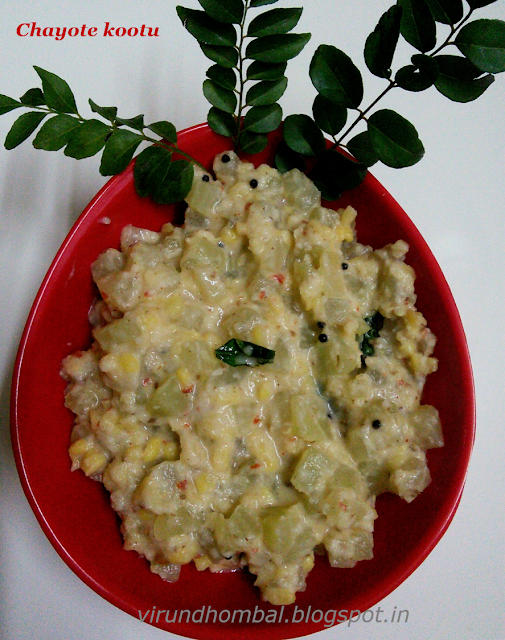 Chow chow (chayote) Kootu is a perfect side dish for rasam, pulikuzhambu and also for rotis. Wash and soak the moong dal with 1/4 cup of water for 30 minutes.Wash, peel and remove the seeds from chow chow. Then dice them. 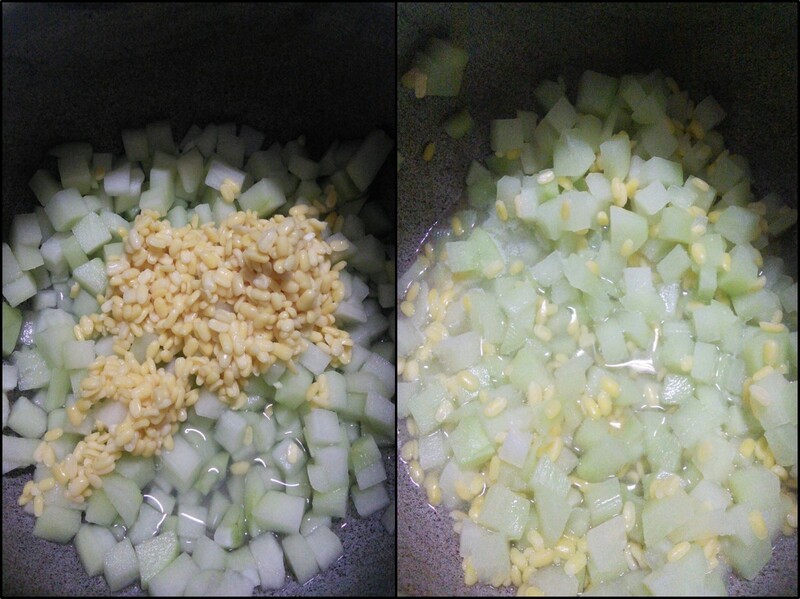 After 30 minutes, take a deep vessel and add the diced chow chow, soaked dal and 1 cup of water. Cook on medium flame until the chow chows are cooked and the moong dals turn soft. 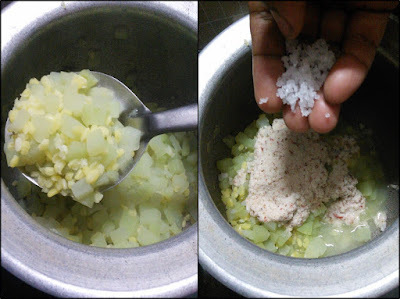 Now add the ground coconut mixture and required salt. Mix them well and keep on low flame. Cook until all the extra water content is absorbed. 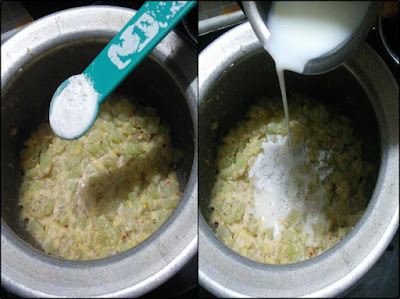 Next, add 1 tsp rice flour and 1/4 cup of milk. After 2 to 4 minutes the kootu gets the thick consistency. Switch off the flame and transfer it to the bowl. Heat oil in a small pan and add mustard, urid dal and curry leaves. When the mustard pops and urid dal turns golden brown, add it to the kootu and mix it well. Wash and soak the moong dal with 1/4 cup of water for 30 minutes.Wash, peel and remove the seeds from chow chow. Then dice them. After 30 minutes, take a deep vessel and add the diced chow chow, soaked dal and 1 cup of water. Cook on medium flame until the chow chows are cooked and the moong dals turn soft. (You can also add pressure cooked moong dal). Yummy Chow chow (chayote) kootu is ready. 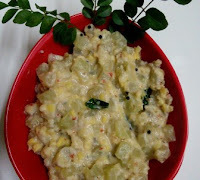 Serve it with pulikuzhambu, rasam and this kootu also taste perfect for your lunch boxes too.